I am offering "brewery gems" for sale - brewery memorabilia from various United States breweries. The types of breweriana include: advertising mugs & steins, embossed beer bottles, beer glasses (etched, embossed, & enameled), beer trays, beer signs, and miscellaneous brewery items such as patches, mini-bottles, openers, beer cans, tap handles, labels, coasters, and other advertising items - with a few foreign items as well! If you find something that you would like, please	CONTACT ME. I accept personal checks, money orders, or PayPal. As a collector I am always hoping to upgrade or add new "brewery gems" to my collection. For my specific "heart's desire" - see my BREWERIANA WANTED page. Perhaps you have some brewery items you wish to part with. 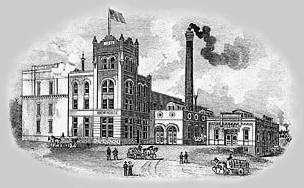 I am currently working on over eighty western BREWERY HISTORIES which began with the Olympia Brewing Co. and its four branches: the Bellingham Bay Brewery, the Salem Brewery Association, the Acme Brewing Company, and the Port Townsend Brewing Company. I've also covered the famous Rainier Brewery and others of the Hemrich brewing dynasty which include: Hemrich Brothers, Aberdeen, Apex, and Columbia Brewing companies. An alphabetical listing can be found on the SITE MAP.